TWO local politicians have come together to try to save Spenborough’s skate park – and it could mean creating a new one. Cleckheaton’s Lib Dem councillor Baroness Kath Pinnock and Batley & Spen Labour MP Tracy Brabin have set aside party politics to help young Jake Butterfield in his campaign to save the park situated behind Spenborough Pool. It looks set to be lost under plans for a £15m revamp of the leisure centre. Describing it as the best facility around, Jake simply said: “We can’t lose it”. The 17-year-old skater from Cleckheaton launched a petition to prevent Kirklees Council from demolishing the park without plans for another – but after meeting with Coun Pinnock and Ms Brabin at the weekend he says there’s now an option to build a new one at a different site. The nearby Royds Park is being earmarked as a potential new home but the petition will need at least 3,000 signatures for plans to be considered by Kirklees. Jake, pictured above, said: “It’s fantastic that Kath and Tracy came down. I didn’t think they’d be interested but it turns out originally Ann Raistrick (a former Lib Dem councillor in Cleckheaton) helped get the skate park there in the first place. “When I set up the petition, I thought the chances were that nothing would happen, but I could say that I tried. “I thought if I do it and something happens then it’s worth it, instead of watching it be demolished. “We’ve got time to get the signatures. It would be great to get a new one, and there’s a lot of funding for youth stuff up at Royds Park so that will be helpful.” Coun Pinnock says Royds Park has been designated as a major play space in the council’s latest plans, which she reckons could “easily include a skate park”. She said: “The skate park was installed as a result of action taken by the then Lib Dem councillor for Cleckheaton, Ann Raistrick. Ann got together a group of young people who made bids for funding and helped design the skate park. That was about 15 years ago. “It is the go-to skate park for young people for miles around because of its design and the high quality of the concreting. “It is most unfortunate that a new Spen pool results in the loss of a popular facility. 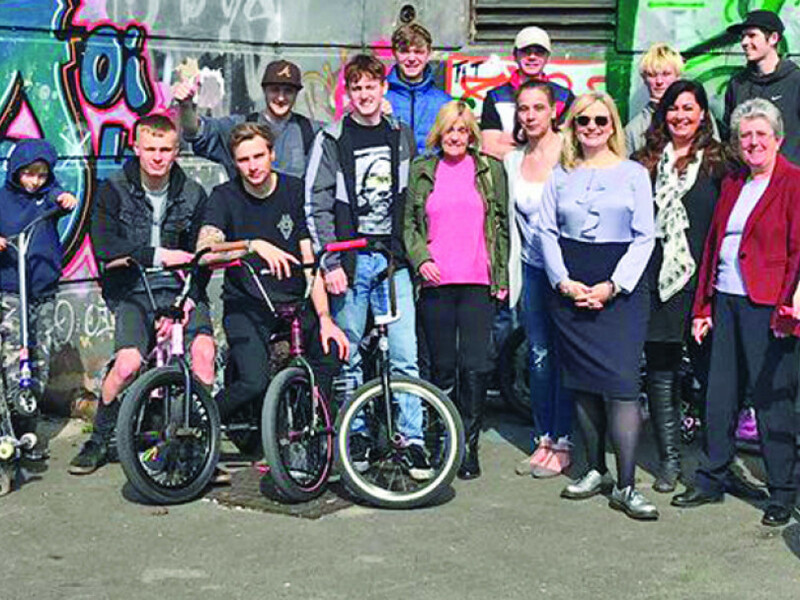 “I met a large group of skate park users on Saturday along with Tracy Brabin. We listened carefully to their passionate views. “Later I took a couple of the group across the road to Royds Park, which is intended to be one of the destination parks in the Labour council’s plans. “There is plenty of room for a new skate park there and the young people agreed it would be a good location. Ms Brabin added: “It was fantastic to meet Jake and the other young people who are fighting to retain a skate park provision. But one campaigner says she feels Kirklees haven’t listened to people’s objections to the leisure centre proposals which would entail the demolition of the skate park. Rebecca Newey, who runs the Pro Xtreme Sports shop close to the skate park, said: “All we’ve got is negative vibes from the council, which is very disappointing. The petition already has more than 800 signatures and can be signed at www.change.org/p/kirklees-council-save-spenborough-skatepark.